How far would you go for a good meal? Would you take yourself from the comforts of Beverly Hills with poolside servers bringing you frozen umbrella drinks and drive three-quarters of an hour away to one of the 10 most dangerous cities in the USA for BBQ? Ben and I did. 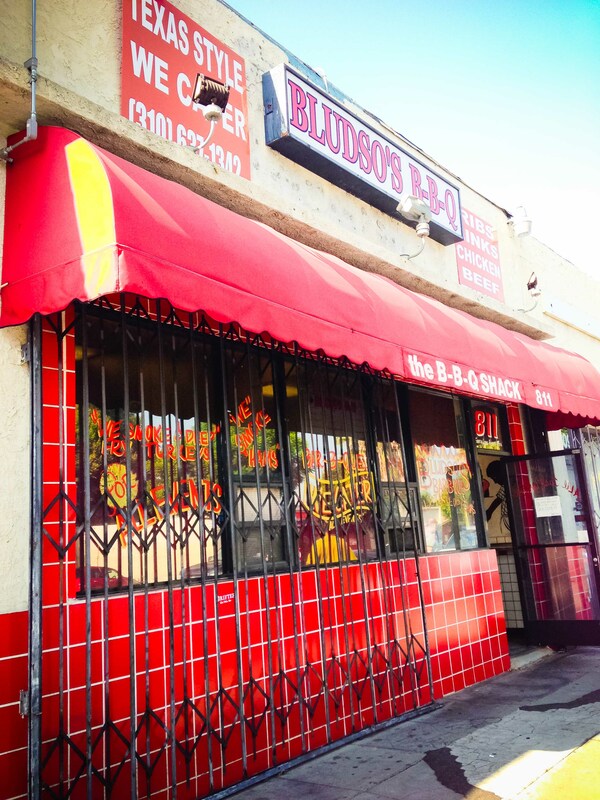 When I first heard about Bludso’s Barbeque in Compton, I never needed convincing to know I wanted to go, but Ben did. So I did my research and talked to the people I knew who have eaten there and the responses were always the same. 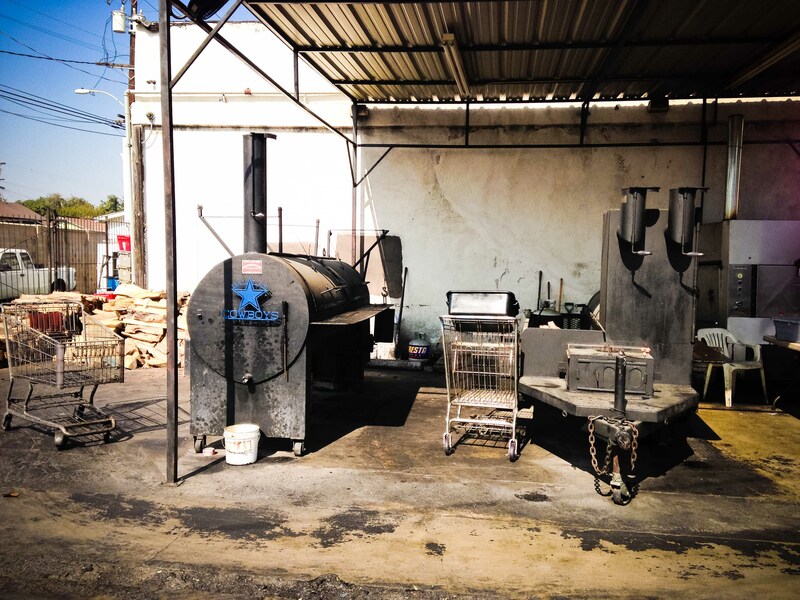 “Delicious Texas-style barbecue”, “amazing brisket”, and “go on the weekends to get the beef ribs”. The message I heard over and over again was that it was safe enough to go if we went during the day, and definitely worth it. I presented this information along with a few supporting documents to Ben and gave him some time to mull it over. In the end, the lure of tasty grilled meats won over fears of the possibility of personal harm. So it was, on a beautiful sunny and warm November afternoon, instead of sunning by the pool, Ben and I got into the car and onto the highway south into Compton. Along the way, I had rationalized that Compton couldn’t be all that bad. I watched Fresh Prince of Bel Air and Jazz seemed like a softy under his hard exterior. Sure, the NWA song “Straight Outta Compton” painted a pretty bleak picture, but that, along with the movie Boyz in the Hood was from a generation ago. As we drove off the highway and into the industrial outskirts of Compton, my fear intensified a bit, but we started to rationalize that the “dangerous” people were probably less than 5% of the population. I was hoping that “they” didn’t come out during the day and that we’d only encounter the other 95%. We parked the car outside of Bludso’s door on a busy street that seemed to be outside the ‘hood. As we walked past a pickup truck, I noticed 2 guys devouring some pork ribs in the front seat. I smiled at them and they smiled back. I realized that in this neighbourhood, I probably shouldn’t be looking anyone in the eye, but at the same time thought that if I was going to get shot at for smiling at someone, then it was my time to go. Bludso’s is more of a take-out joint than an eat-in, and without really thinking about where we’d eat our meal, we ordered WAY too much. 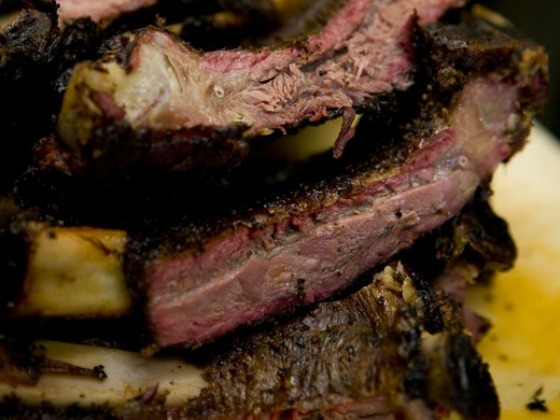 We got the lunch order of beef ribs and brisket and a 1/2 slab of pork ribs. Each of the lunches came with 2 sides so we tried the potato salad, coleslaw and a double order of beans. We threw in a small mac and cheese, just because. After we paid, Ben noticed the corn bread. I went to buy a couple of slices of corn bread and was told “no problem baby” as she threw some of those in for free. As we were waiting for our feast, more people started cramming in to place gigantic orders. As much as I appreciated the cordial (ebonic) banter going on between the patrons and staff, I decided to wander out back to check out the barbecues. I noticed a picnic table hidden in the back and thought it would be a good place to eat so when we got our spread we opened it up right away to sample the goods. As we had our faces fully buried in our haul, we became aware of our surroundings. The picnic bench was located behind a run-down apartment building that had very loud music blasting from within. What we soon came to realize was that “hidden” is not an adjective that you want to use in Compton. We decided that it would be smarter for us to pack up our food and find another place to eat it, like the comforts of our hotel room. So was the barbecue worth the potential danger? I’d definitely drag someone to Compton with me again (because I’d never go myself) for their beef ribs slathered in spicy sauce. The beef ribs were the best I’ve ever had. So was were their baked beans. I’d have them throw in a slab of pork ribs because those were pretty amazing too. Maybe I’d try some rib tips or pork links because I would take a pass on the brisket next time. Ben would order the mac and cheese again. I wouldn’t because in my mind it just took up room where more meat could be. Don’t believe me about how good the beef ribs were? LA Weekly name them #22 in their top 100 things to eat in LA list. I hear Kevin Bludso is teaming up with a group to open a bbq joint in Hollywood. And for what you’d potentially lose on authenticity (greasiness), I’m sure you’ll gain on atmosphere and safety. Yeah, that sounds like how I want my next Bludso’s experience to be. 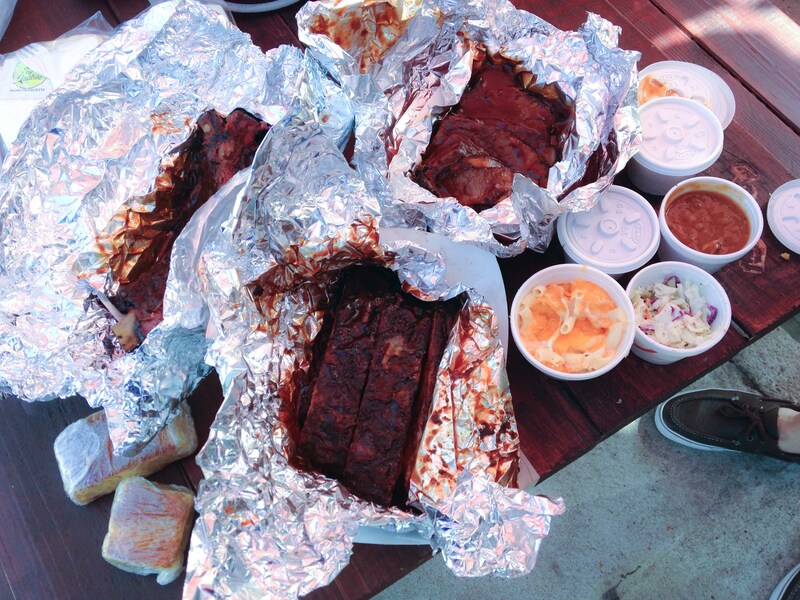 OMG I love it that you guys actually drove to Compton for a BBQ joint. Jay and I used to drive to that hood once a month to get authentic Jamaican seasoning and REAL Carribean food during our time living in LA. It’s a little different going with a black guy though, he gave me some tips of the hood politics, pretty much no eye contact and don’t stare anyone down no matter how funny you think they look. And definitely don’t come off like you’re threatened at all, just like dogs they smell fear and they will take advantage of you.